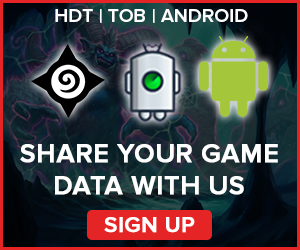 A weekly Hearthstone Meta Report based on data from over 140,000 games. 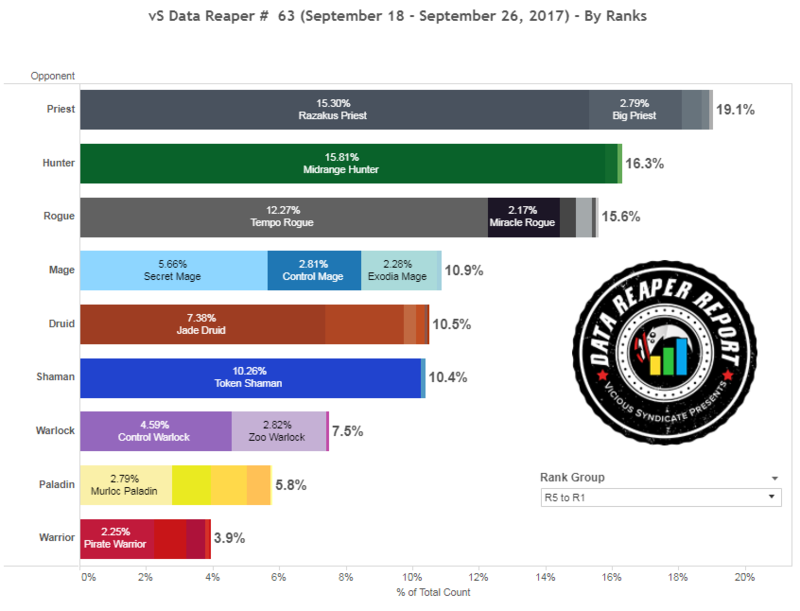 Welcome to the 63rd edition of the Data Reaper Report! The balance changes have shaken up the meta in a very profound way. The Druid population has crashed harder than the Shaman population did in MSG after its own balance patch. We’ve gone from 40% Druids at legend to 12%. The change to Innervate and Spreading Plague certainly encouraged players to look in other directions. In terms of archetypes, Jade Druid is still quite common, and sees more play at legend ranks, but Aggro-Token Druid has taken a bigger hit in its popularity, dropping all the way to around 2% representation. Other Druid archetypes are very niche. The new hotness is Priest. Razakus Priest has been touted to dominate the post-patch meta, and it was flocked towards from the first day. Big Priest has retained its small representation, and hasn’t taken off in the same manner. Overall, Priest is the most popular class in the game and most common at higher levels of play. The other new hotness is Rogue. Unlike Priest, however, which spiked in play on the day of the patch and remained steady since, Rogue’s popularity has been constantly increasing every day. The culprit to Valeera’s newfound relevance is the emergence of Tempo Rogue, an aggressive deck built around Prince Keleseth. Miracle Rogue is still out there, but has been largely overshadowed and saw no significant change in its numbers. The other new hotness is Hunter. Or is it? While it’s true that the class has spiked hard in its popularity compared to the pre-patch days, it’s behaving exactly the opposite from Rogue. It was extremely popular on the first two days of the patch, but has been on a gradual decline since. More importantly, its decline at legend ranks is at a faster pace, and the discrepancy between its representation at different skill levels, a familiar trend with Hunter, is quite significant. Other classes that seem to have benefitted from the balance changes are Mage, Shaman and Warlock. Mage has seen an increase in play across all levels and has retained representation of three primary archetypes: Secret, Exodia and Control. 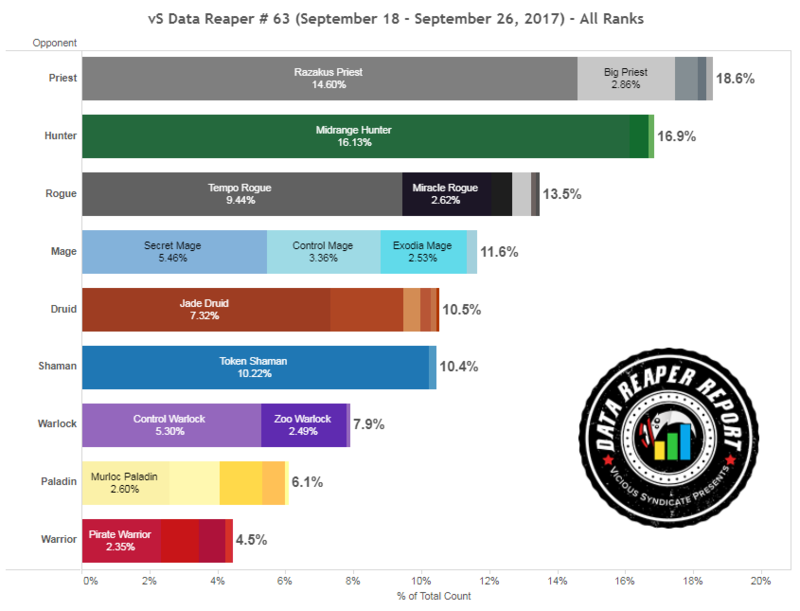 Within the class, Secret Mage has edged out the others and established itself as the most popular Mage deck, while Exodia Mage is the least popular. Shaman is still a one deck class and has an interesting relationship with Hunter. Token Shaman is a fantastic counter to Hunter, and has risen in response to Rexxar’s popularity in the first few days of the patch. However, as the Hunter class started to decline, Shaman plateaued and its popularity is now trending down. We can notice that Shaman’s popularity at legend for example, where Hunter is less common, drops. Both Zoo Warlock and Control Warlock have seen a significant uptick in play and the class, for now, appears to be showing signs of life and activity, with its popularity increasing on a daily basis. While Control Warlock is more popular overall, at higher levels of play, its numbers shrink while Zoo’s numbers grow. The other two nerfed classes, Warrior and Paladin, have dropped to the bottom of the meta. Paladin has been on a gradual decline since patch day, while Warrior crashed much harder and has shown little signs of life. The tribal aggressive decks of Pirate Warrior and Murloc Paladin remain the most common archetypes for their respective classes. We have a new meta, and a new Queen of the Frozen Throne is sitting at the top. Valeera is back. Tempo Rogue is the strongest deck in the game, and that is true across all levels of play. The good news is that its win rate at legend is lower than Jade Druid’s win rate before the patch by a whopping 2%. (!) This means that while Tempo Rogue is strong, it’s not too dominant to bring the meta to its knees. 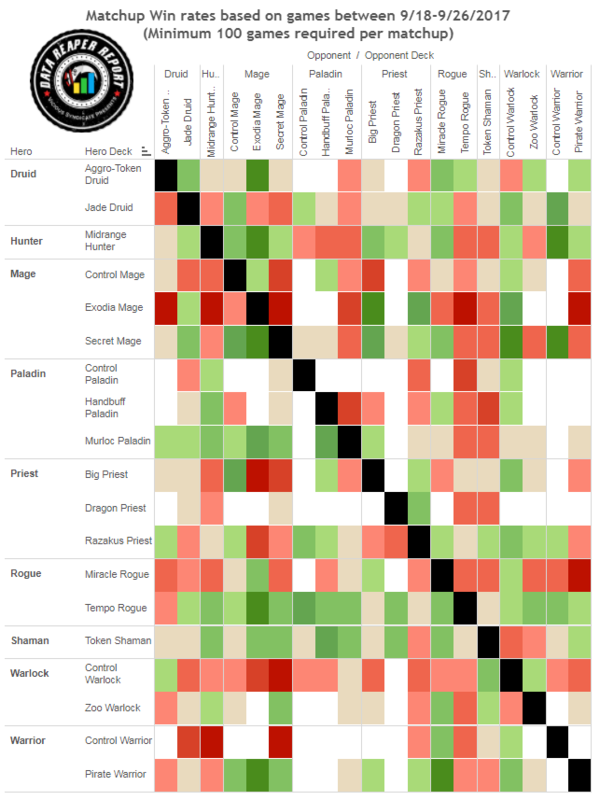 Looking at its matchup spread provides a clue as to why this archetype is so strong: it doesn’t really have bad matchups. There is a slight vulnerability to Razakus Priest, Token Shaman and Aggro-Token Druid but these matchups are still very close. It seems that other than specific tech (Golakka Crawler), it’s quite difficult to target the archetype in the current meta. Tempo Rogue has developed a stigma of being a high-roll deck that’s largely dependent on playing Keleseth on 2. While Keleseth definitely increases the deck’s chances of winning significantly, the reason why the deck carries such a high win rate is that it wins games even when Keleseth is not drawn. It is much more consistent than it is given credit for. Anduin was looking forward to finally be sitting at the top of the meta after the balance changes, but his seat has been taken away from him. Even so, Razakus Priest looks incredibly strong and is gunning for the #1 spot at legend. There is a significant discrepancy between Razakus’ power level at legend, where it is a Tier 1 deck, and outside of it. There are two reasons for it. The first, which is relatively minor in comparison, is the deck’s skill cap. It’s noticeable, but it’s actually not a huge part of why it performs better at legend. The major reason is build choice. The biggest skill in piloting the deck is optimizing it, and here lies the trap for netdeckers. There have been multiple players who have hit #1 legend with the archetype, by utilizing highly teched lists that targeted a narrow field of opponents at top legend. What happens next is that these lists are blindly copied, card for card, and used in a different, wider meta. These builds then underperform, since they utilize tech choices that don’t make as much sense outside of the context of that player’s specific run for #1. The result: Razakus Priest performs worse at lower skill levels. While this effect is true, to some extent, for every archetype (which is why we’re careful about featuring these ‘narrow’ lists in general), it’s very punishing for Razakus Priest. How to avoid it? Start off with vanilla lists that are not too highly teched, and be fluid with your flex spots. We discuss this in the Priest section. Has the Jade Druid beast been slain? It appears that Jade Druid’s power level has been toned down significantly to the point where it is no longer ridiculous and killing off the rest of the meta (just remember the legend table before the patch, where we had only 4 decks with win rates of over 50%). However, do note that Jade Druid is one of the least optimized archetypes in the game right now (more so than Priest) which is typical of a deck that has undergone significant changes. This means that Jade Druid has a sizeable scope for improvement, and we wouldn’t be surprised if it ends up climbing back to Tier 1. It still does fairly well against Priest and doesn’t have glaringly bad matchups that cannot be overcome with smart tech, which is why we think Jade Druid will end up being one of the strongest decks in the game and will likely increase in play. Surprisingly, the Druid deck that’s currently displaying a higher win rate is Aggro-Token Druid. Despite the loss of Innervate, which fueled many of its explosive openings, the archetype has successfully adjusted and looks like a top tier performer despite being massively underplayed. We don’t expect it to stay underplayed for long as it is one of the only answers to Tempo Rogue’s dominance, likely due to its ability to run Golakka Crawlers without sacrificing its efficiency. We do think its current low play rate is somewhat helping it perform better, as most players are expecting Jade Druid in the mulligan phase, but even if it gets more popular, the mulligan headache should give the class as a whole the same advantage it has had since the days of Un’Goro. Let’s talk about the biggest false dawn of the balance changes, which belongs to Hunter. 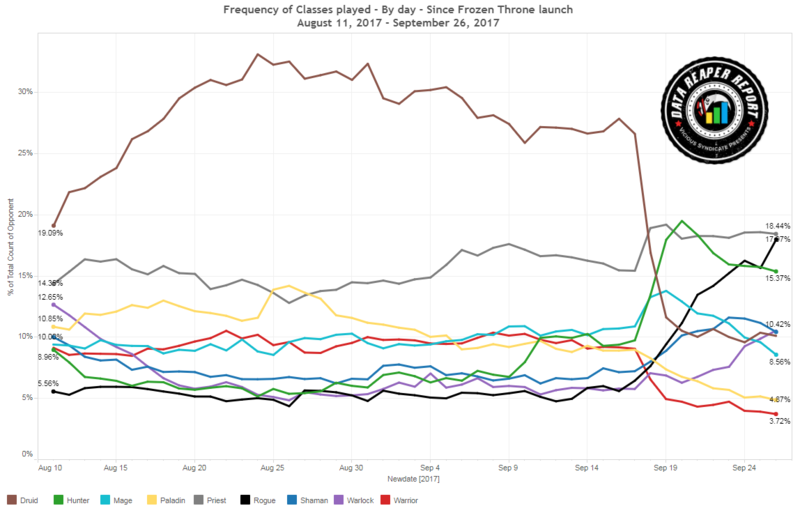 The class looked incredibly good during the first few days of the patch, and had a monumental collapse in its win rate since. We’re talking about a 3-4% win rate drop over the course of a week, which is mind blowing. Midrange Hunter had a good time beating some janky decks after the patch went live, but then came the Tempo Rogues and the Token Shamans who quickly brought down Rexxar back to earth, and perhaps below that. Its win rate at higher levels of play has yet to stabilize and continues to sink, and we’re not sure when the bleeding will stop. The class that arguably looked the strongest on day 1 might be the weakest, relatively speaking, on day 10. One of the Hunter killers, Token Shaman, has enjoyed farming the overplayed class to its heart’s content, launching itself to a Tier 1 spot. However, much like a parasite killing a host, it may soon find itself in a much more hostile environment that could bring it down a notch or two. This is why we think that Shaman could soon drop under the 52% win rate mark and settle down as a moderately strong deck, but not an elite one. Its poor matchup against Razakus Priest is a significant hindrance for it going forward. Zoo is back, ladies and gentlemen. Don’t be fooled by its current aggregate win rate at legend, which is below 50%. Pay attention to its win rate increase. The archetype’s win rate has increased by over 7% since the patch went live, and this number keeps climbing across all skill levels. It is a previously barren wasteland that is only now receiving more attention, experimentation and refinement. This is why we think Zoo can continue to grow and become a legitimately competitive deck, likely headed for a respectable Tier 2 status. For the first time since this year’s rotation, Warlock has come alive. Your soul shall suffer! While Pirate Warrior and Murloc Paladin have seen a significant collapse in play, our metrics show that these decks are still quite competitive and should not be underestimated. Are they the overpowering menaces they used to be? No, but the balance changes hasn’t killed them, just toned down their power levels to the point where they are strong but not oppressive. Other archetypes of these classes however, don’t look too great. The interest in the Warrior class looks pretty much dead without Fiery War Axe and archetypes with ample sample sizes, as well as ones without, look awful. Paladin looks to be in a better spot, with Control and Handbuff Paladin having win rates that are reasonable, but definitely on the weak side. Aggro Paladin (non-Murloc) isn’t seeing much play, but from the little play it sees, it’s decent enough to land a spot in Tier 3, but not too much beyond that. As for other, less prominent archetypes. Big Priest is definitely stronger as a result of the balance changes, and the meta is shifting in its favor with the decline of Hunter, one of its most difficult matchups. Secret Mage also looks reasonably strong at the moment, but its future looks grim due to current meta trends. Though it performs well enough against Jade Druid and Razakus Priest, there are many aggressive decks that beat it down pretty hard which are expected to become quite relevant in the future (Pirates, Murlocs and Zoo). This isn’t quite the “slowed down meta” it needed to thrive. Dragon Priest has seen a big boost in its power level, but it’s still below average and has similar struggles to Secret Mage when it comes to dealing with faster decks, which does not bode well. Both Exodia Mage and Miracle Rogue are very weak ladder decks due to the meta still being quite aggressive. The expected “slow down” has not occurred, and control decks in general are still very weak. We know that many consider Razakus Priest to be a control deck, but its current iterations heavily lean to a combo play style with burst damage rather than a value oriented plan. Perhaps the reason why control decks generally struggle in Hearthstone is that there aren’t enough late game win conditions that carry powerful clocks, compared to things like Ultimate Infestation and Anduin/Raza. Control decks need win conditions that say “You didn’t kill me, so now I’m going to force the issue and you’re gonna die”. Uther of the Ebon Blade is a great example, but doesn’t have enough support in terms of card draw and activators for it to work consistently yet. Decks that only say “I’m going to survive until you run out of stuff to hit me with” just don’t work at the moment (and perhaps, some people would say, they shouldn’t?). It’s happened. Priest is the most popular class in Hearthstone, which is not surprising considering the lead up to the balance changes. Razakus Priest was the strongest deck which was left completely unchanged by the balance patch. Since this is the case, it’s obviously a great comfort pick for the players trying to climb with a deck they already know is strong. Razakus Priest is a bit unique in terms of builds. Multiple players have hit #1 legend with it, and every one of them teched his build according to a local meta he was facing. So, the archetype is more punishing to netdeck without thought than other archetypes since some techs are a big hindrance if they’re brought to a different meta than the narrow one often seen at top legend. The deck, as a result, is difficult to optimize. This is why we’re featuring two lists that are light in tech and share 26 core cards, which are good as a benchmark and a solid starting point. Both lists feature Velen/Mind Blast, as the combo is important in the Jade Druid matchup, a deck that’s expected to rise in play. The first is a standard build that maximizes cycle, inspired by Feno. The flex spots are Tar Creeper (strong against aggro in general), Gnomish Inventor, Cabal Shadow Priest and Greater Healing Potion. The second list is inspired by Zalae, and includes the Auchenai/Circle combo, along with Wild Pyromancer and Binding Heal, which work well with each other and Circle of Healing. There are many other cards that often see play in Razakus Priest builds. Kabal Talonpriest and Kabal Courier are common 3-drops. Golakka Crawler is mostly relevant these days in the Rogue matchup. Holy Nova can provide an extra board clear against Shamans and aggressive Druids and doubles up as potential card draw with Cleric. Gluttonous Ooze is less recommended due to the decline in Warriors and Paladins. Skulking Geist can help against Druids and Shamans, but the primary game plan against Jade Druid with a Mind Blast list is burning them down before being overwhelmed, and your own 1-cost spells are important for that. Elise also does not contribute to the burst plan, so doesn’t make sense with Mind Blast. Other notable techs: Mass Dispel (Shaman), Big Game Hunter (Hydra), Dirty Rat (Mirror, Exodia Mage), Coldlight Oracle (Jade Druid), Eater of Secrets (Exodia Mage). Big Priest is still out there and can catch you off guard if you’re not ready for it. Its ability to high-roll its way into a blow-out turn 4 Barnes play cannot be underestimated. The deck is also a soft counter to its counterpart in Razakus Priest. 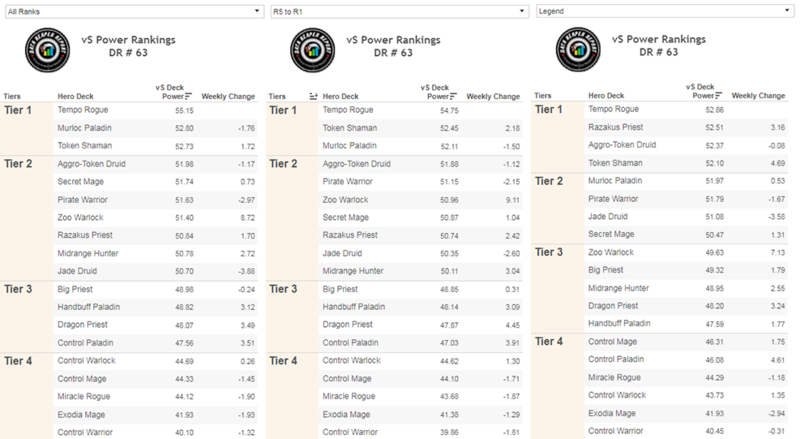 C0ntrol Boy took a variant with Mind Vision to #3 legend this past week, and it appears to be a possible sleeper deck going forward as everyone focuses on its more popular counterpart. Finally, Kefan took a double Golakka Crawler Dragon Priest to #5 legend, featuring Cobalt Scalebane, a card seemingly exploding in popularity. The Golakka Crawlers are meant to help the archetype keep up the pace against aggressive decks, which can be troublesome. This is a new meta, and a new time for Rogue to shine once again. One of the least represented classes before the balance changes, Rogue is now one of the most popular and dominant classes across all ranks. Rogue’s increased popularity is led by the rise of Tempo Rogue, the archetype that carries the highest win rate in the game. Prince Keleseth and Shadowstep allow for some very one-sided games and force opponents to quickly reach for the bottom right button. However, the real power of the deck, and the reason for its consistency, is its ability to win when it is not able to find its best draw. Vilespine Slayer, Bonemare and SI:7 Agent enable tempo swings that truly justify the deck’s name – Tempo Rogue. Neutral 5-drops such as Bittertide Hydra (which excels against Druid) and Cobalt Scalebane (which excels against Priest) give the deck the kind of punching power that allows it to capitalize on these tempo swings to end the game. When these kind of threats are further buffed by Prince Keleseth, the deck reaches its full potential. The Pirate package is also a key part of the deck. If you thought Patches was a menace before, just wait until he is shooting out of a cannon as a 2/2, a 3/3 or greater. Southsea Deckhands and Leeroy Jenkins provide the finishing burst, especially when combined with Cold Blood or Shadowstep. Shadowstep is a versatile card in the deck, going beyond the use with Prince Keleseth to synergize with many of these decks’ minions due to their powerful battlecries. Many players have reached high legend ranks with the archetype. 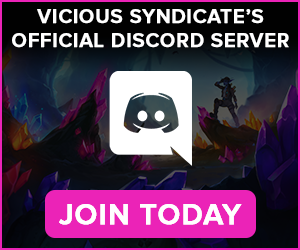 Asmodai was one of the early innovators, reaching #1 legend with his list, which includes Shadowcaster and forgoes the Bittertide Hydras/Cobalt Scalebanes. Mr Yagut’s #2 legend list differs from Asmodai’s by 2 cards, with a Plague Scientist and a Lotus Assassin replacing a Cold Blood and the Shadowcaster. Ryzen reached #3 legend with a heavier mid-game build that favors Cobalt Scalebanes over Bittertide Hydras. This build, with either Hydras or Scalebanes, performs better in slower matchups such as Priest and Jade Druid. Corbett hit top 10 with an Elemental build that’s stronger in aggressive mirrors for the cost of burst potential. Miracle Rogue remains on the fringes, and it’s struggling due to the fast pace of the meta. Builds from Casie and Zanananan have been successful in the early days post-patch, but have fizzled out since. Quest Rogue has had a notable achievement this week, with Yangbongkun hitting top 10 legend with the archetype. The deck looks to prey on Priests and Jade Druid, but will have a hard time queuing into aggressive decks. Druids have undoubtedly taken a big hit with the balance changes. Jade and Aggro Token Druid’s play rate has plummeted. However, both archetypes are still performing very well against the field, as they have found ways to stick around as powerful decks even with the loss of Druid’s best card, Innervate. Even at 6 mana, Spreading Plague is still an incredibly powerful card against aggressive decks, and remains a staple in Jade Druid builds. Most Jade Druids run two Mire Keepers in order to consistently ramp to Ultimate Infestation, a card that has remained unchanged. With the meta still in flux, keep an eye out for the deck’s flex spots. Spellbreaker is one tech that’s almost always chosen, but other options include Mind Control Tech, Tar Creeper, Doomsayer, Golakka Crawler and Medivh. Zalae’s build runs Dirty Rats, which have synergy with Mind Control Tech and can disrupt Razakus Priests, Exodia Mages as well as control decks running Skulking Geist. Aggro-Token Druid has lost one of the most feared openers in the game: Innervate/Vicious Fledgling. Many people suspected that the deck would take a huge hit, due to how often Innervate can seemingly snowball the board out of control. However, the archetype remains very powerful, and holds a great matchup spread. Neutralmilk’s build is fairly similar to pre-patch builds, but drops Innervate/Fledgling. Instead, it includes Tar Creepers and Golakka Crawlers, which are pretty powerful cards in the current meta. Since the deck runs Crypt Lord, there is also merit to include a Crazed Alchemist if you’re running into a lot of Doomsayers. Icer’s build, with which he hit top 50 legend, is drastically different. It cuts Bittertide Hydras and most of the deck’s 3-drops, which are much slower without Innervate, and includes Snowflipper Penguins. The Penguins are strong targets for Mark of Y’Shaarj, and offer the Druid a way to cheat out tokens and buff them without Innervate. Since the deck is faster and tends to empty its hand very quickly, Genzo finds its way into the build. 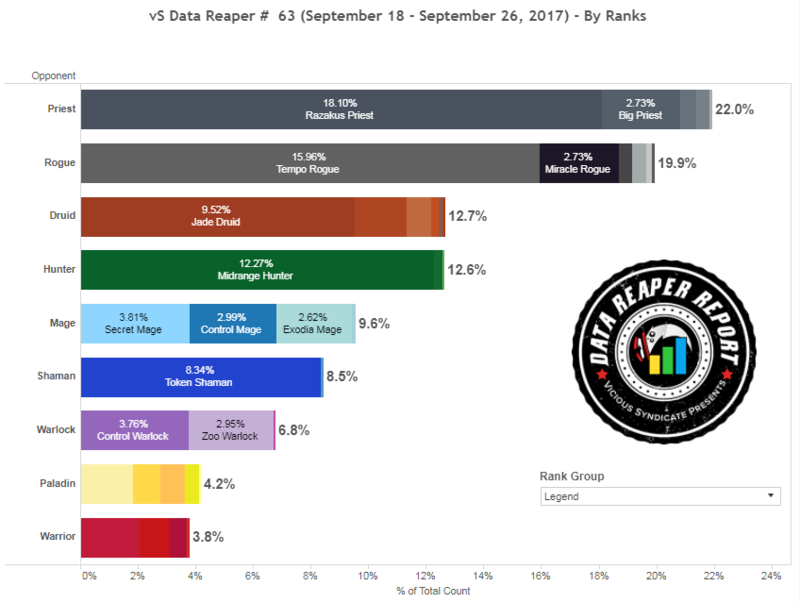 Hunter took over the meta for a couple of days after the nerfs, but as Tempo Rogue has grown in popularity, Hunter play rate has fallen. An increase in one of its worst matchups alongside a decrease in the slow, experimental post-nerf control decks, have led Hunter to become a fairly middle-of-the-road class. At the moment, with the high number of Tempo Rogues and Token Shamans, it’s become harder for Hunter to pick up wins. The class needs the meta to slow down a bit for it to thrive, as its matchups with Razakus Priest and Jade Druid (post-nerf) are fairly close. The most important development in Midrange Hunter lists following the balance changes was the inclusion of Bittertide Hydras to beat Priests (and Druids). Razakus Priest only has one direct way to deal with a turn five Bittertide, so slamming it down, especially followed by a Highmane, just wins games against the most popular deck in the game. Deathstalker Rexxar is optional, but not a must include in Hydra lists since you’re looking to end games quickly. The other major shift in Hunter is the inclusion of Fire Fly over the pirate package. The pirates are prone to the Golakka Crawler tech that’s fairly popular due to Tempo Rogue’s meteoric rise. In addition, Bloodsail Corsair’s ability is less relevant with the War Axe change. Feno’s rank 1 legend list is a good representation of a pirate-less Midrange Hunter, while TheBest’s more recent top 10 legend list represents a pirate list. Both builds include the Unleash/Hyena package, which improves your odds of winning your worst matchups. Secret Mage is currently the most popular Mage deck in this post-patch meta. This is unsurprising since its strong early game no longer has to compete with a War Axe farming its minions, or Druid innervating out an annoying mana-cheating play. Eloise hit top 50 legend with a variant of the deck that includes Bittertide Hydra and Bonemare for a more powerful minion-based mid- to late-game that can really put the heat on Jade Druids and Priests. Another option is to forgo the Hydras for Burgly Bullies and add Antonidas instead of a second Bonemare. This makes the deck less explosive, but still keeps it quite dangerous for the aforementioned decks. Breezyy reached #11 legend with a Frost Lich Control Mage that includes Elise and Sindragosa. This build carries a lot of value which ensures a very strong late game plan in control matchups. Skulking Geist prevents the infinite value plan of Jade Druid, making the matchup more manageable. However, the archetype struggles against Shadowreaper Anduin so trust other Mage decks if you are facing a lot of Razakus Priest. Exodia Mage is the third significantly played Mage deck. It is decent against Jade Druid, and is the strongest counter to Razakus Priest, but has miserable matchups against aggressive decks. This makes it potentially a more enticing option in tournaments rather than ladder, in a lineup meant to target the two most popular tournament decks (though it is more of a soft counter to Jade Druid). Shaman is reinvigorated with the recent changes to several top classes, namely Warrior and Druid. The class’ usage rate and win rate have seen a significant uptick, as players are now experiencing more success with Token Shaman. 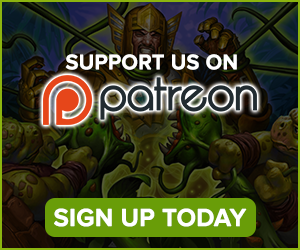 The Jade Druid matchup has become more bearable with Spreading Plague’s increased cost, while the high number of aggressive decks on ladder provides Token Shaman with matchups that are decided by early board battles, something it excels at. One thing that hasn’t changed is Token Shaman’s standard build, which remains exactly the same and the one with which AlwaysLucky hit #1 legend. The second Devolve and the Saronite Chain Gang are the two flex spots that are sometimes replaced. Two Chain Gangs can be quite strong in control matchups by curving into Thrall, Deathseer, while Golakka Crawlers are also common to target Rogues. Other Shaman archetypes are pretty much dead. With the Hex nerf, they might be even weaker. Slow Shaman decks just can’t mount enough pressure to bother Jade Druid and Razakus Priest, two archetypes with much more intimidating clocks. Warlock has benefited significantly from the balance changes and the suddenly diverse meta that has come about, with Zoo Warlock in particular benefitting greatly from the hits on other classes’ early game prowess. Prince Keleseth has become a staple in Zoo and is near-universally played. Satellite has been hovering at the top legend ranks with multiple iterations of a midrange build that tops at Bloodreaver Gul’dan, another card that’s becoming a staple in Zoo (we’re featuring his latest build). HotMeowth was also seen in the top 100, with a Pirate list that takes advantage of the interaction of Keleseth and Patches. Both of these lists have slight discard elements with Malchezaar’s Imp, Soulfire, and Doomguard, but we’re far away from Silverware Golem and other discard mechanics seeing the light of day again. They also include Vicious Fledging, which is a strong card against Jade Druid and Priest. Finally, the latest trend has been to run Blood Imps and Crystalweavers. Crystalweavers offer a powerful turn 4 play in an otherwise weak mana slot, while Blood Imp is a cheap demon that can buff some of your threats out of removal range, and works really well with Keleseth, Crystalweaver and Bonemare. As for Control Warlock, Sjoesie piloted his heavily teched build to #25 legend, including an interesting selection of 3 drops and Prince Valanar, while Sjow had success with a more conventional build that runs Twilight Drakes. While Control Warlock has seen increased representation, please note that many of the most relevant decks are poor matchups for this archetype, and it might need further improvements or a meta shift to be consistent enough. Murloc Paladin is still very much a thing and is quite a strong deck, despite seeing significantly less play. It has the same poor matchups that it had before (aggressive mirrors, mainly Shaman and Rogue), but is positioned pretty decently against the rest of the field. Not much has changed in terms of builds, with Corpsetakers being stronger in aggressive mirrors, while running a Curator package with Scalebanes should improve your matchup against Priest. Handbuff Paladin is still being championed by Brian “Please don’t call me “Brian “Brian Kibler” Kibler” Kibler, who piloted his new brew to legend after the patch went live. Cobalt Scalebane makes another appearance as the Priest hate levels rise in the meta. Much like Bonemare and Spikeridged Steed, it can create a “must answer” board seemingly out of nowhere. Kito peaked as high as #10 legend with a Control Paladin list. One of the main problems with playing this archetype on ladder is the guaranteed long games and lack of a blowout late game plan (a la Razakus Priest). Dirty Rats are becoming more popular in the meta as they provide counter play to Raza. Watch your opponent’s mulligan and look to play Dirty Rat just before their turn 5. Consider adding a Skulking Geist to have a better chance against Jade Druid. The nerf to Fiery War Axe has, predictably, gutted the Warrior class. It is the least popular class at every rank, possibly for the first time in the class’ history. All is not lost though, as Pirate Warrior is actually still a pretty good deck, and while nowhere near as good as before the War Axe change, it is still acceptable to climb with and will probably rise in popularity again after the player base realizes this. Zlsjs hit #1 legend this week, keeping the War Axe in the deck. The lack of a power play at the 2 mana slot is solved by aggressive decks’ new darling in Prince Keleseth. Fire Fly offers a pseudo 2-drop that dodges the build limitation imposed by the Prince, and is a good card in general due to the abundance of Patches. Bittertide Hydras continue to be nailed on staples thanks to their strength in the matchup against Druid and Priest. To make way for Keleseth, Bloodsail Raider and Heroic Strike are cut. With War Axe’s increased mana cost, Bloodsail Raider is a much worse card anyway, while Heroic Strike is also easily cut since it’s one of the worst cards in your bad matchups. That was all she wrote. There is nothing else of interest in the Warrior class. Tempo Warrior ceases to become Tempo without a 2 mana War Axe, while slower builds just fall far behind without their best tool at fending off early aggression. It’s very unlikely that any Warrior not named Pirate will be even remotely successful until the new expansion at the earliest, and even then, a lot needs to be done. First, let’s mention something important. As of this moment, the meta looks to be pretty balanced from a power level perspective. We don’t observe decks that are clearly overpowered. Razakus Priest is, at the moment, not the monster it could have been. Jade Druid has been toned down. The tribal aggressive decks have been weakened. In addition, all 9 classes currently have archetypes that boast competitive win rates at legend of around 50% and above, with Hunter being the biggest question mark. 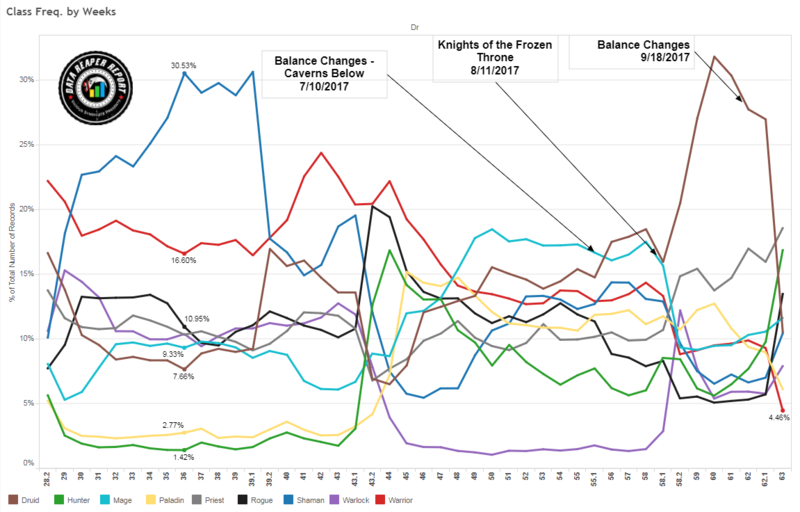 We’re definitely in a better spot than before the balance changes, and we’ll have to see how things develop, since the meta is far from being settled. So judging by their current power levels, what do we expect will be the best decks coming into next week? We think Tempo Rogue and Razakus Priest are definitely 1A and 1B. Tempo Rogue is just straight up powerful, while Razakus Priest is just as powerful with a proper meta read. Aggro-Token Druid is a sleeper powerful deck that we think could come back in a big way, and Jade Druid has a strong case going forward due to being one of the only reliable counters to Priest, having favorable meta trends as well as being far from optimized. For now, this is a meta which will be defined by this axis of classes. Play them, or learn to beat them. 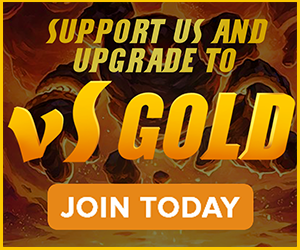 Special thanks to Leo G, Chungfr, Kognar, Aaron B, Jed M, Caleb G, Drew M, Alan J, lalasong, Eric L, Steve F, Batz, Jeffee83, Zolstar, Pink Mage Diaries, and Dekkster Gaming for supporting us for the month of August. Aggro Pally isn’t included, only mentioned in the report, but the version with keleseth actually has a decent WR and it shows a lot of play in rank 5~ Legend in the asia server. How do you explain that the nerfed aggressive decks (pirate warrior, murloc paladin and aggro druid) see so little play even though they remain good ? Psychological bias ? Nerf withdrawal. Happened with Shaman too. A deck that gets nerfed drops in popularity and it takes a while for it to climb back up if it’s still good. Is fatigue/ mill warrior lumped under “control warrior” for this article? Or does it simply lack the representation on ladder to be included in the report this week? Why no fatigue or control decklists? Fibonacci’s NZoth list and Dog’s fatigue list deserve mention.. The former. Most if not all Control Warriors are the fatigue variants.